The following is by special request of a friend of the Neighborhood, and appropriate given today’s holiday, Bastille Day. I wrote this in late 2002 for the now-defunct Flak magazine, an internet magazine that featured the likes of Clay Risen, an author, classmate of mine and former editor of the New Republic, as well as sports commentator for NPR Bob Cook. This was among my first stabs at web writing. Have fun. The recent death of French publisher Charles Dupuis, who introduced the world to the Smurfs, is cause for an assessment of the legacy of the three-apples-high community that captivated youths in the ’80s. The Smurfs, the happy blue creatures on our television screens on countless Saturday mornings, looked harmless enough: Happy, cute, loveable, content, ready to help each other in times of trouble, especially when the evil wizard Gargamel was lurking. A loving, functioning community. Behind this community of loveable little elflike creatures lurks the sinister machinations of the French Revolution. Finally, in one collection of animation cels, the culmination of the Republic of Virtue as illustrated by Maxmilien de Robespierre, the architect of the Reign of Terror. A pseudo-democratic society that values freedom, it is in reality an authoritarian regime that is neither democratic nor free, and prizes uniformity, obedience and civic virtue over all other ideals. It may be a cartoon, but it is by no means innocent. Let’s start with the attire. All the Smurfs wear essentially the same garment: white pants (similar to the attire of the sans-culottes of the radical Jacobins) with a hat that strangely resembles a liberty cap from the revolutionary period. Sure, there are some specialty garments, by Smurfette (the slutty little Girondist Charlotte Corday), the miner, the doofy yokel (The peasants of the Ile-de-France who suffered the brunt of the Terror) and of course the painter, who was the only Smurf with a French accent. Their very own Jacques Louis David, the painter must do heroic portraits of none other than Papa Smurf, the de facto leader of the Smurfs. 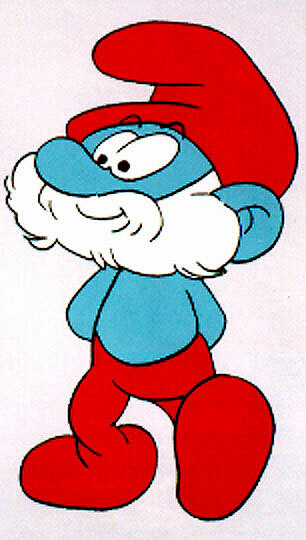 Papa Smurf, like Robespierre, has no official title as head of the republic. He, and only he, wears the virile and virtuous red pants and cap, thus painting him in the colors of the French Tricolor. One can almost picture this little blue citizen singing “Le Marseilleise.” Although the community had the trappings of a democratic society, with open discussions, arguments and debate about what to do (usually led by the one-Smurf intelligentsia Brainy Smurf), ultimately all power rested on the primary Smurf characters, a Committee of Smurf Safety (the only ones we know by name) and, ultimately, Papa Smurf, first among equals. How did Papa Smurf come into power? He was not a king, he had no title to rule. At one time (although the series never elaborated on this), the Smurfs were under Gargamel’s more direct control. However, they banded together and cast off the chains of tyranny to form a democratic Smurf republic. Yet the royalist threat still loomed, and to ensure the safety of the republic more power ended up in the more radical Papa Smurf faction of Smurfette, Brainy, etc. They would ultimately shape Smurf society to what we now know. And what kind of community did Papa Smurf envision? A uniform, outwardly happy society based on strict morals and ultimate obedience. Why didn’t any Smurf ever have the audacity to countermand Papa Smurf? Robespierre envisioned an orderly, virtuous proletarian republic based on imposed equality through direct democracy, punishment and violence. Now, this was a G-rated cartoon, so we, as children, saw no tumbrels filled with traitors to the Smurfs heading to Madame de Smurf-etine. However, it is safe to say that Papa Smurf had to have dealt with anonymous troublemakers here and there. In a population of a few hundred, one Smurf disappearing here and there would not make much of a difference in our eyes, especially if its of the nameless masses of Smurfs we never heard from anyway. Where was God, or some supreme being in Smurf society? The Smurfs apparently never worshipped anything but maybe nature and a nationalistic warlike fervor against perceived attacks by the royalist Gargamel. Again, like Robespierre, Papa Smurf chose to keep the Smurfs on a permanent war footing (Their outwardly peaceful demeanor doesn’t fool anybody.). This, to me, is the only explanation as to how a three-apple-high community can outfight a wizard. Let’s not forget that Gargamel is a wizard, his Divine Right bestowed by his magic powers (ineptly used, but Louis XVI was no brain surgeon, either). The only way the Smurfs could combat enemies from without and within (Brainy was the most willing to collaborate with Gargamel) is complete suppression of dissent, instillation of uniformity in thought, word and deed, and a subtle martial demeanor to keep the community on a high state of alert. Only then could republican government in the forest be maintained. This society, like all authoritarian societies, could not last. In the later stages of the show we saw the introduction of characters like Sassette, who eschewed the uniform whiteness of the imposed order in favor of more colorful, Directoire garb. Ultimately (It is a pity the series did not last this long), the primary Smurf characters would kill themselves off, first Brainy and his supporters, who saw no need for more Smurf bloodshed. Papa Smurf would succumb to the Smurf-etine. The younger characters would reform the government and rule in moderate, inept fashion over Smurfs who increasingly use colors in their garments. That is, until a new leader emerges to take the Smurfs on a path of conquest. If anyone has an idea as to which Smurf works best as Napoleon Bonaparte, let me know.